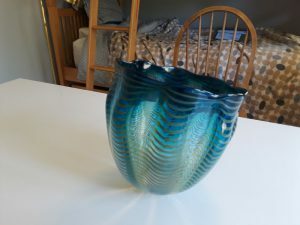 Chihuly glass for sale | What is it worth? The glass ‘basket’ is done in blue and yellow with striping in the glass and ruffle form. These are from the Seaform Persian Basket line by Chihuly. This particular color and style have been cataloged as ‘striped zebra’. Usually seaforms consisted of various pieces to make a small sculptural grouping. 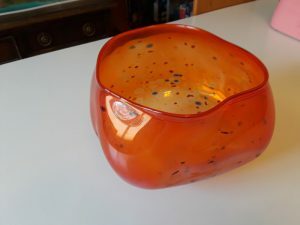 The glass ‘basket’ is done in an orange color with a red lip. 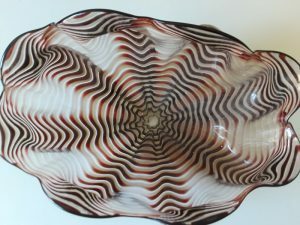 The mottling in the glass is referred to as macchia. 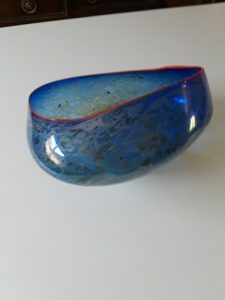 The glass ‘basket’ is done in a mottled cobalt blue, called macchia, with a red lip.